So often we are asked, "What are the differences among the five Frankincense essential oils that you offer?" "Which one should I buy?" So we have decided to offer all five in one kit at a discount! They are all beautiful and possess similar therapeutic properties. In general all Frankincense essential oils have many, many benefits to offer. It is wonderful for the skin. This essential oil is both cicatrisant and cytophylactic. It is skin healing and effective on boils, acne and scarring on the skin as well as to assist stretch marks to fade. Being cytophlactic, it promotes the regeneration of healthy cells and keeps the existing cells and tissues healthy. Also effective as an antiseptuc on wounds and cuts. Try using it in a facial cream for wrinkles too. Great for digestive issues. 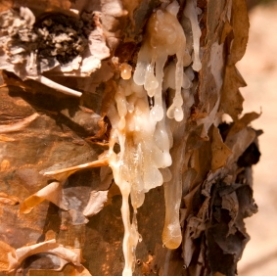 Frankincense speeds up the secretion of digestive juices and facilitates peristaltic motion. It is also a carminative giving relief from gas and indigestion. Frankincense is a powerful expectorant and very effective for respiratory issues such as colds, flu, asthma, and other lung issues. Relieves bronchitis and congestion.